"When I think of you, Cheryl, I remember flying on horses,..."
"Cheryl, I am so sad to hear of your passing. You always..."
"Sure was fun in high school and after. Going to miss you,..."
"Cheryl, my dear friend. 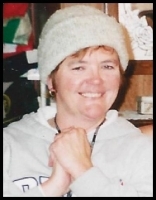 I cannot believe you were taken so..."
Cheryl Marie (Trimbo) Roesler died peacefully on Sat., March 2, 2019, after a long struggle with chronic illness at the hospital in Deer Lodge, MT. She was 56. Cheryl was born in Vancouver, WA to Bob and Inez Trimbo, the youngest of their 11 children. She graduated from Prairie High School and attended Clark College. Cheryl worked retail for most of her career in Vancouver and Portland, OR. Cheryl met and fell in love with Mike in 2008. They made their life together in Deer Lodge, where they enjoyed outdoor activities, horses, their dogs, and Blue Grass Festivals, including a Blue Grass Camp on the West Fork of the Bitter Root River, where they were married May 29, 2009. We will remember Cheryl for her big heart, easy smile, generous spirit, her gift with horses, and her ability to teach everyone to ride. She will be greatly missed. Cheryl is survived by her husband, Mike Roesler of Deer Lodge; her daughter, Courtney Nelson (and granddaughters, Paisley and Teagan) of Vancouver; sisters, Barbara Anderson, Kathy Harwood (Tony), Mary Carlile (Bill) and Nancy Condon; brothers, Jim Trimbo (Shirley), Jack Trimbo (Brenda), Tim Trimbo (Cheryl), Bill Trimbo (Juana) and Richard Trimbo (Rhonda); stepsons, Tyson Roesler (Elyssa) (and grandchildren and Avary and Aria) and Aaron Roesler (Holly) (and grandchildren, Kinsley and Grayson); and many, many more nieces, nephews, grandnieces and grandnephews. She was preceded in death by her parents; nephew, Brandon; and her beloved big brother, Steve Trimbo.